Cook pasta according to package directions in a pot of boiling salted water. In large skillet over high, heat butter and oil. Add chicken and cook 4–5 minutes until browned and cooked through, remove from skillet and set aside. Reduce heat to medium, add garlic and onion and cook for about a minute. Add chicken broth and stir, making sure to scrape up any browned bits. Bring to a low boil and cook until liquid has reduced by about half of its volume. Add cream and stir to combine. 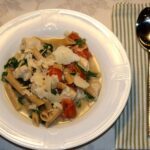 Stir in arugula, cherry tomatoes, pasta, and chicken. Garnish with Parmesan and fresh basil, serve.